This afternoon I met up with Molly Steenson, Enrique Ramirez, and John Szot to hash out just what we are going to cover on our Meet the Architects panel at SXSW Interactive. Amped on good coffee and thick slices of grilled pita bread, we dashed from tangent to tangent. Somewhere in there, John, an architect who works for the media firm Digital Foundry in Brooklyn, noted that these days it is easy to get so caught up in what is flashing on the screen, and calling it architecture, that actual buildings become an afterthought. I bring up the conversation not to (re)start any paper architecture debate, but because with this discussion in mind I came across a paper written in 1947 by inventor and light artist Thomas Wilfred. Wilfred’s work has fallen into obscurity of late. Ranging from the surreal to the psychedelic, his career stretched from the 1920s until his death in 1968. His medium was light, manipulated into dreamlike compositions of varying colors and intensities. A practice he called lumina, it falls somewhere between music, painting, and sculpture. Trained as a musician, he would build complex contraptions, Clavilux, to play his works. The lumia artist conceives his idea as a three-dimensional drama unfolding in infinite space. In order to share his vision with others he must materialize it. This he may do by executing it as a two-dimensional sequence, projected on a flat white screen by means of a specially constructed projection instrument controlled from a keyboard.Seated before the keyboard he may, by manipulation of sliding keys, release white light, mold the light into form, add color and imbue the result with motion and change. 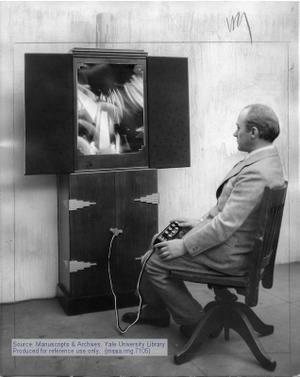 But the original vision—the three-dimensional drama in space—is constantly before him and he strives to add, by optical means, an illusion of the missing third dimension to his flat screen image, and to perform it so convincingly in a spatial way that the screen creates the illusion of a large window opening on infinity, and the spectator imagines he is witnessing a radiant drama in deep space. I came across this article because a friend recently gave me a DVD of Wilfred’s work to check out. While I was dubious at first, picturing lava lamps and Sparkletts’ Dancing Waters, but then the jadedness washed away. Here was something proto-digital, which without bits or bytes and certainly not filmic, created space on screen. While I think the projections are pretty groovy, the projectors fascinate me. Unlike sleek laptops, the Clavilux were clunky boxes full of gears: objects desperate to escape the physical, but ultimately tied to their bulk. For more images, the Yale University Library has an archive of ephemera related to the artist and the majority of Wilfred’s work is privately conserved by the Epstein Collection.